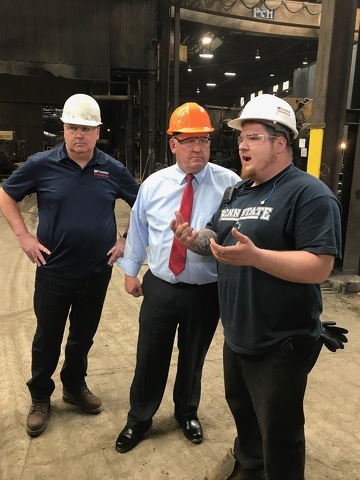 U.S. Rep. Glenn “GT” Thompson, R-Howard Township, visited Franklin Industries in Venango County in May. This election is going to be a little different for U.S. Rep. Glenn "GT" Thompson, R-Howard Township. Since 2009, he has served as congressman of the 5th District, which included all of his lifelong home, Centre County. But, after redistricting last winter, the congressional map split Centre County in half. Now, his beloved Penn State is out of the district. “To lose half of my home county and, you know, the Penn State campus — you know I certainly bleed blue and white, and I will continue to be the No. 1 advocate for Penn State. University Park will not be in my congressional district,” said Thompson. He still is disappointed by the way the districting map was redrawn by the Pennsylvania Supreme Court, but the congressman has moved on. “You know, if this was done constitutionally, there would have been state house and state senate members who would have voted for this legislation and the governor would have signed into to place, and all those positions are accountable to the voters,” he said. “If you allow these Supreme Court justices to do it, they only get elected once; they don’t even stand for election ever again. Up against Susan Boser, a Democrat from Indiana County, in the new 15th, Thompson's campaigning area still retains a large part of Centre County, including Park Forest Village, Toftrees, Benner Township, Philipsburg, Pleasant Gap, Milesburg, Snow Shoe and Bellefonte. He said he has been visiting the new areas that make up the 15th District, and he sees similar demographics and issues in Cambria, Indiana, Armstrong and Butler counties. “The four new counties that I will be serving are wonderful counties, and are quite a great fit with the current Pennsylvania 5th Congressional District that I have been serving for some time. There is just a lot in common. They are rural areas. Education is important. Agriculture is the No. 1 industry. There is a lot of energy development that is consistent with the rest of the district,” said Thompson. Recently, Thompson championed a bill that was passed to offer greater support and resources for career and technical education, which is something that Thompson feels strongly about. House Resolution 2353, the Strengthening Career and Technical Education for the 21st Century Act, overhauled the Carl Perkins Career and Technical Education Act. Thompson said he brought the bill to Congress because he believes that career and technical schools, such as Central Pennsylvania Institute of Science and Technology in Pleasant Gap, are important for preparing Americans for the jobs of the future. Thompson said he has been a promoter of career and technical education and feels the timing is important right now. With low unemployment, there are a lot of jobs that are not filled, and he wants to give people the tools they need to advance. He said the bill will increase access to the schools for people looking to expand their educations, and also looks to include businesses in that education. The increase in funds is something that is well worth it to Thompson, if it gets people jobs with which they support a family. Thompson sites CPI as a strong example of what a career in technical education can do. He said he was amazed recently about the story of a young man who struggled in school, but went to CPI for welding and, a year after graduating, was earning a six-figure salary. He said that while that is not always a possible outcome, it shows that there is opportunity out there. Thompson said Centre County has a history of high underemployment, with people who are working two or three jobs because of low rates of pay. He feels his bill can help with that. Thompson also said he is proud of the work done to receive a federal grant for the Interstate 80 and Interstate 99 interchange project. Long a supporter of veterans, Thompson is excited by the VA Mission Act of 2018, on which he directly worked. It allows veterans more choices in their health care, including telemedicine. “(It allows) our veterans to get the health care that they need, when they want and where they prefer to receive it,” said Thompson. Thompson mentioned his pride in being able to stop the Army Corps of Engineers' plan for Sayers Dam in Howard. “That was ridiculous that they wanted to shorten the year by prematurely lowering those water levels. It would have had a tremendous impact economically,” said Thompson. Congress currently is working on the 2018 Farm Bill, and Thompson said he has some great provisions in the bill to help dairy farmers. According to Thompson, the problems for dairy farmers go back to the Obama Administration’s 2009-10 Healthy School Lunch program. Thompson said he believes a whole generation of kids were turned off from drinking milk by the skim milk offered in schools, and now they don’t choose milk when they are at home because they do not like the taste. He said his provisions will make it easier for schools to sell milk with fat in it so that kids will want to drink it more. He said this will help with some of the oversupply issues that currently are hurting the industry. “Since we lost a whole generation of milk drinkers, if we can achieve the next one, they will go home and ask mom and dad for milk and it will be a market solution,” said Thompson. Thompson said he sees that things have been a little more divisive during the last two years. He said he does not understand why, but said Congress has been productive despite the contentiousness. “I hear a lot of hateful speech sometimes — at least that’s part of what you see from the mainstream media — but from my perspective, below the surface, it is productive. It takes productive leadership to bring people together in a bipartisan way to accomplish the things that matter most. That has always been my commitment and what I am known for,” said Thompson, who used the technical education bill as evidence. He said that while he spent most of his political career working under the Obama Administration, and many of his constituents weren't very happy with that administration, he was proud that he was able to work with the president on some things. He said this term has had a different tone. “I didn’t see the disagreement raised to the level of hate there is today that I see focused predominately on President (Donald) Trump, which is kind of counterintuitive when given the outcome that we see today with record unemployment, and growth domestic product growth at 4.1 percent, and consumer confidence at an all-time record high, and the amount of job growth,” said Thompson. As far as the issues facing the current president, Thompson said from the beginning that the Mueller investigation should go where the evidence takes us, but that the investigation has gone on too long. “He (Mueller) needs to do his job. I was supportive of that, but it is not something that should continue forever. If he is not finding the evidence, this needs to be a reasonable period of time. There are millions of dollars being spent on this investigation,” said Thompson. Thompson said he does feel that Russia tried to interfere with the election by sharing propaganda through TV and the Internet, especially concerning the energy policy. As far as the president meeting with Russian President Vladimir Putin, Thompson said he believes that Trump is working to get things back in order. Moving forward, Thompson said he hopes to earn re-election but he still has work to do in this session of Congress. He plans to continue serving on the House Committee on Education and the Workforce, among other things. He also wants to continue as vice chairman of the House Agriculture Committee, overseeing the Farm Bill and helping the dairy industry, and hopes to be considered as the first Pennsylvanian to be chairman of that committee. “That would be a tremendous honor and responsibility. That is a goal,” said Thompson, who also would like to be part of the Armed Services Committee. He said the most important issue moving forward may be saving Medicare and Social Security, as they look to become insolvent in the next decade. Thompson said he sees a positive outlook for Pennsylvania and the region in the future.